Each home has its own charming atmosphere and environment that is a reflection of the character of the family living there, their tastes and personality. There are homes where glamour takes precedence to warmth, where rustic organic materials allows for the connection between spaces as well as areas within the home that seem extended due to the use of colour. The house we visit today on homify is determined by the placement of natural lighting, with the intention being that the light envelopes the home during the day, creating a heavenly feel. 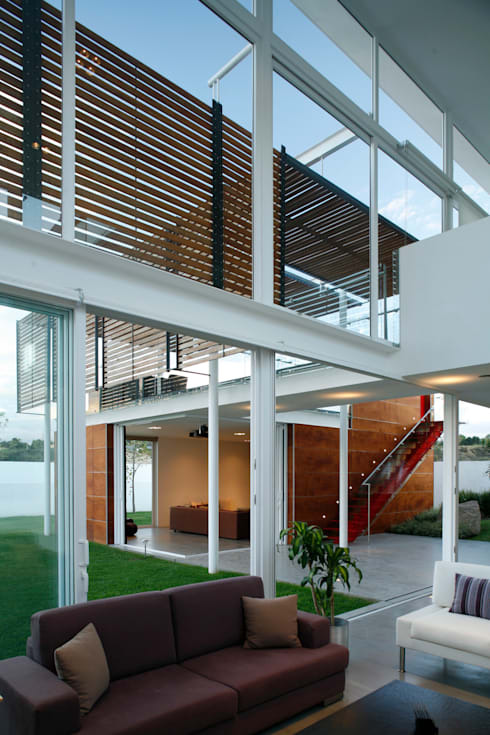 In order to achieve this, the architects of Echauri Morales, based in Guadalajara, placed large glass not only vertically but also in indoor spaces and transitional surfaces. The clean lines presented by this combination and wooden slats behind the glass achieves a wonderful feeling of spaciousness and brightness. 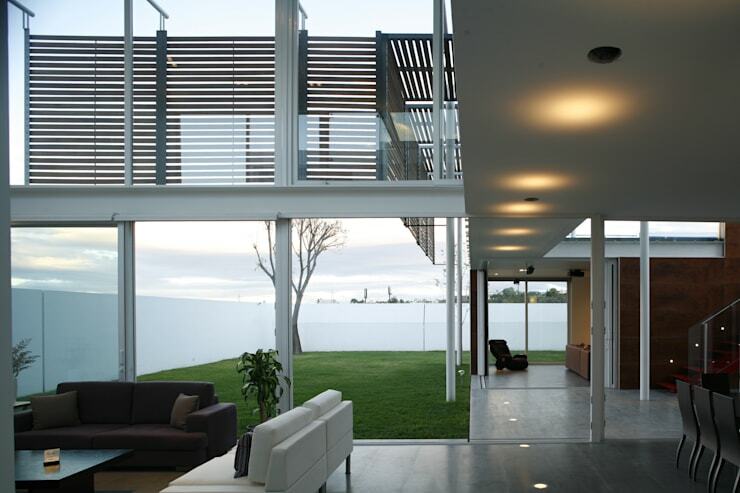 The exterior of the house shows us a very warm, contemporary and friendly face. The cubic volumes are clear, and its architecture speaks in a very simple and easy manner that is elegant and sophisticated, while being bold and out of the box too. From the outside we discover the importance parasols have in the home, making the space bright and elegant. The façade is generally minimalist in style, and does not exceed the elements that it is comprised of which includes wood and large windows that seem like big eyes looking at the world. The garden was designed with few species and elements in mind, giving prominence to the sculptural quality of quarried stone and red oak, ash and sycamore. Entering the social area we can see a series of slides and space connections that are simply wonderful! From the room you can see a cinema in the background, where a side wall also consists of a window that integrates the interior with the exterior. At the centre, there is a courtyard with a steel staircase painted red, which invites visitors up to the second-floor terrace, a glass cube that is fully protected by wooden slats, giving it privacy without omitting the entry of light and heat. 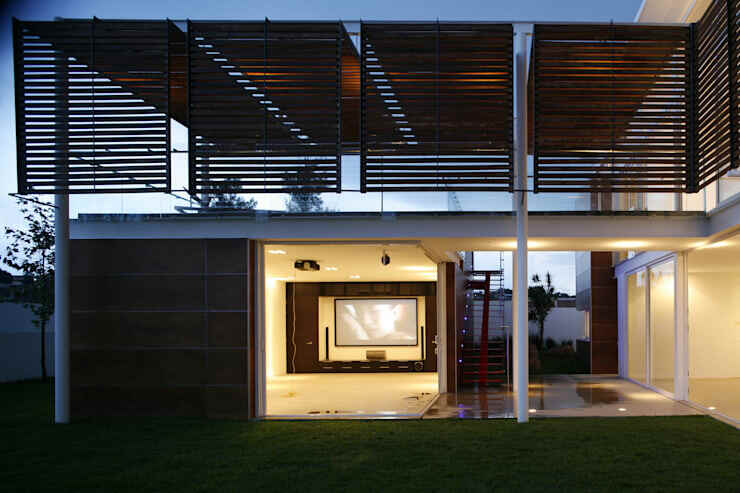 In these spaces, PVC windows can be opened completely by sliding on the marquetry, connecting the home with the garden. This modern kitchen has a strong minimalist character. 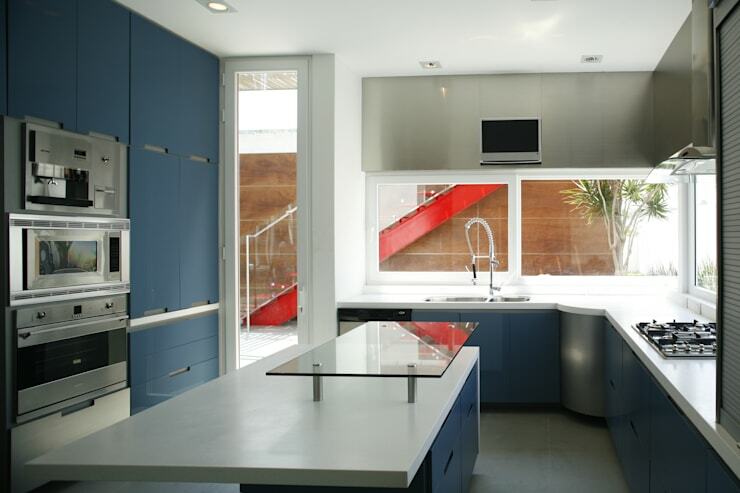 The blue tone of the cabinets and cupboards completely hides away any objects and utensils. The kitchen island also serves as a cupboard, making a functional and practical breakfast area, while the grey floor, stainless steel, glass and blue matte colour of the doors create a warm and cosy space to prepare food, bon appetit! 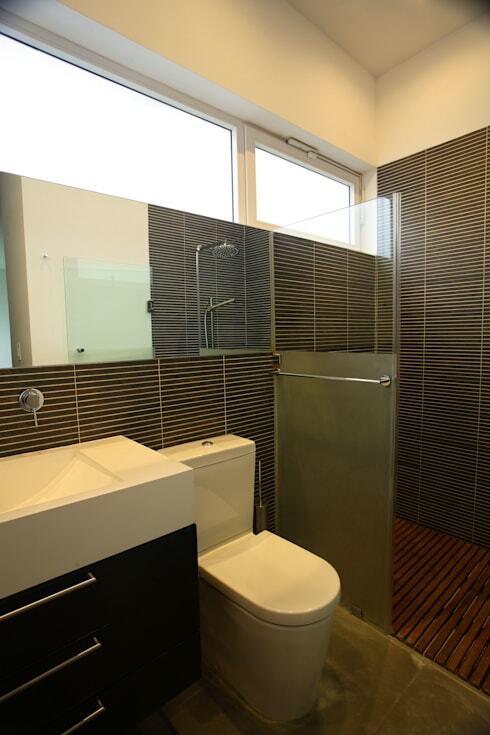 Without neglecting the sophistication and style of the entire house, the bathroom is dressed in wood and glass to create a comfortable, yet relaxing, warm and friendly atmosphere. The furnishings and fixtures are completely modern in design, and have been installed on a polished concrete floor, making a wonderful contrast with bamboo wood occupying the tub and wall tiles. The light is still the most amazing part of this space situated in the corner of the home. Finally we see an image taken from the entrance of the room, where transparent angles of the house are elegantly on show. This creates a seamless atmosphere with glass floating on the top floor, while wooden slats and the generous garden creates an example of excellent taste and quality that this residence which is full of style and light, is also full of warmth and harmony of space. How many houses have the privilege of this perspective? Very few! And this house has: on an indoor theatre as well as courtyard. Occupying the huge room of glass with steel is the impressive red staircase that becomes almost like capsule of light during the day and enigmatic lookout point during the night. How many stories can be told in a place where the stars can be observed or witnessing the sunrise live under the covers? If you prefer something a bit more rustic, then you might enjoy: A Wooden Family Home of Stylish Simplicity. 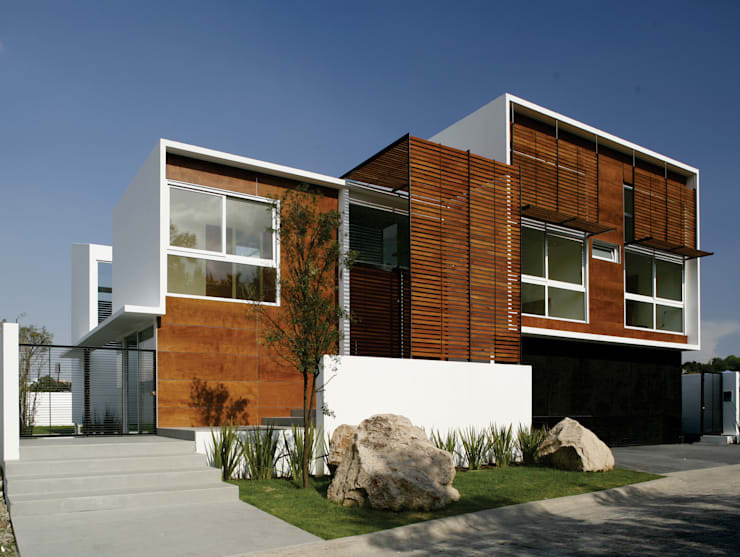 Did you like this contemporary wooden home? Let us know your thoughts in the comments!